Samsung’s latest innovative hotel display tv lets your guests have complete control of their in-room settings by unlocking unlimited opportunities to stay informed and entertained through a range of customized content. With Samsung Hospitality solutions, Hotels can benefit from more efficient communication and personalized customer service delivery without requiring a major infrastructure overhaul. typically come with standard two year warranties with option to purchase extended coverage. Post-sale services also include exchange for any damaged TV upon arrival or on-site repairs by certifi ed technicians. have limited warranties that can be voided when TV is used in a commercial setting. Hotel owners would have to incur full cost of service which negates any savings generated upfront. are compatible with technology solutions that allow content across hundreds of in-room displays to be managed from one central location. This allows for much more effi cient operations of your hotel. 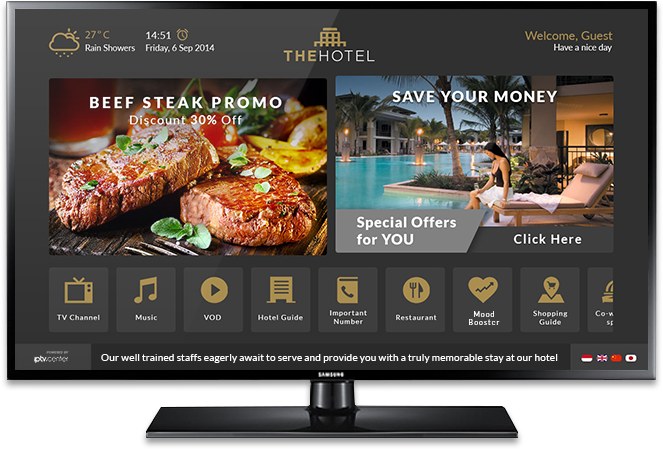 hospitality technology solutions cannot be operated with consumer TV without external hardware, certifi cation and labor. Overall, extra costs are incurred to set-up each in-room display individually. Digital Rights Management (DRM) technology is typically required to deliver HD entertainment to your guests. All hospitality TV come embedded with Pro:Idiom and/or LYNK DRM technology to ensure secure deployment of content across multiple rooms. Consumer TV do not come equipped with encryption technology to protect HD programming from illegal duplication. A set-top box would be required with each television which would signifi cantly increase ownership costs. offer lockable features to prevent guests from tampering with the settings such as lock-out capabilities on TV rear panel and menu display. Another popular feature is volume limiter which prevent guests from causing any disturbances. lack the ability to lock-out guests from altering the TV settings. All Samsung hospitality TV come with lock-out controls and volume limiters to prevent guests from causing any disruptions to your day-to-day business.